Kate Oswin - 1st violin; Alicia Berendse - violin; Lydia Abell - viola; Ghislaine McMullin - cello. Jack Body - Three transcriptions; Ravel - Quartet in F Major. The Dvorak is memorable for its buoyant melodies and wistful moods. The Ravel sometimes referred to as impressionistic modernism was first played in Paris in 1904. Jack Body breathes new life into music from other cultures. 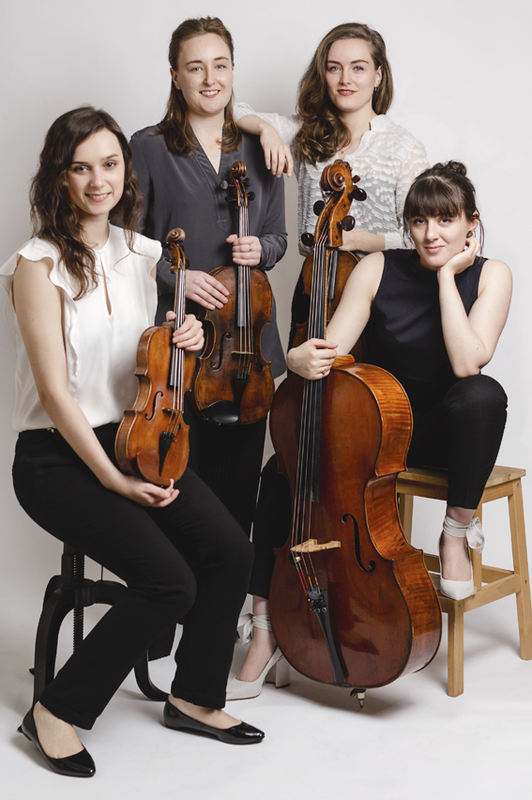 The Behn String Quartet seem set to claim a worthy place within the highly competitive International Chamber Music world. Tutored by leading mentors Martin Outram, Levon Chilingirian, Christoph Richter and financially backed by ‘Help Musicians UK’ and the Cavatina Chamber Music Trust. They have a busy 2017/18 concert schedule which includes Wigmore Hall debut, West Cork Chamber Music Festival, a residency at the Zhejiang Conservatory in China and this tour of New Zealand for CMNZ. ​The Beethoven and Brahms works are top ten favourites but the Vasks I am keen to know, as his violin concerto is a commanding revelation of the spiritual in music. 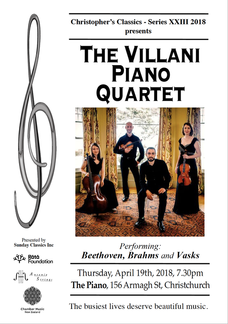 The Villani Piano Quartet was formed at the end of 2015 in Auckland and is a dynamic new ensemble for the Chamber Music scene. 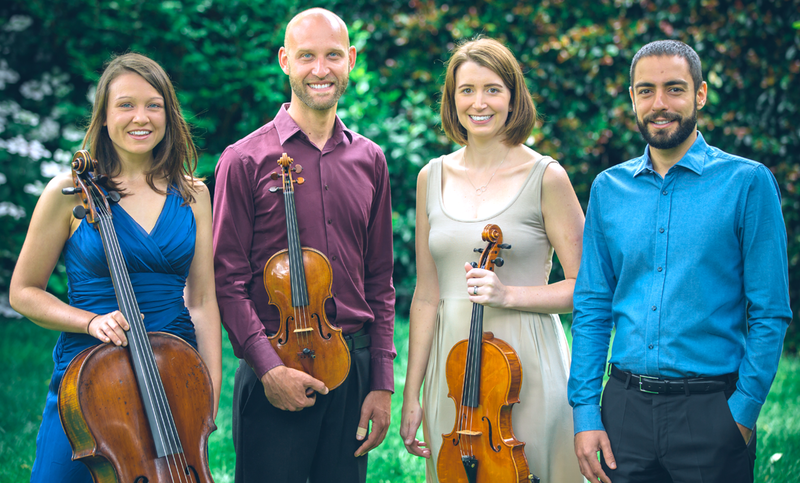 With both local and international experience the quartet has come together with a drive to present the unique richness of the Piano Quartet genre. 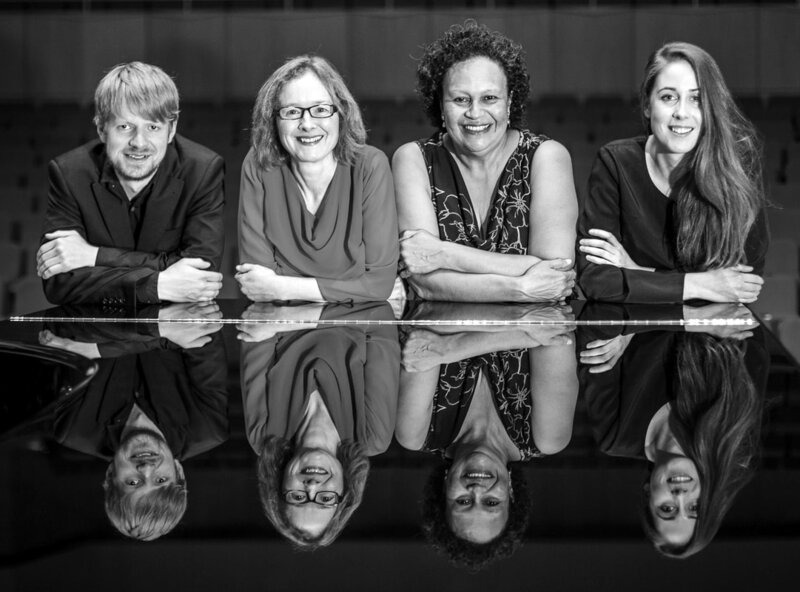 The Villani Piano Quartet has already received critical acclaim throughout the North Island in a collaborative tour for Chamber Music New Zealand. You may remember Flavio Villani was the pianist featured in the film Crossing Rachmaninoff which premiered in the NZ International Film Festival in 2015 in Christchurch. Each year, celebrated Melbourne-based Kiwi violinist Wilma Smith invites performers of promise to form a group and create vibrant programmes that include everything from revered masterpieces to undiscovered gems of every musical era. 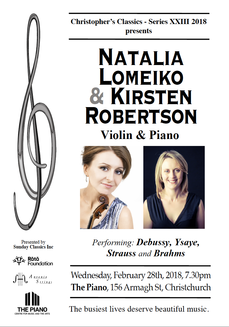 This year she is joined by well-known viola player Caroline Henbest and two rising New Zealand-born stars of the Australian National Academy of Music (ANAM) in Melbourne – Alexandra Partridge on cello and Andrew Leathwick on piano. Wilma Smith, former Concertmaster of the Melbourne Symphony Orchestra and the NZSO, was born in Fiji and raised in Auckland. She studied in Boston at the New England Conservatory before becoming first violinist of the Lydian String Quartet, winners of the Naumburg Award for Chamber Music and multiple prizes at the Evian, Banff and Portsmouth International String Quartet Competitions. She also worked regularly with the Boston Symphony Orchestra and was Concertmaster for the Harvard Chamber Orchestra and Handel and Haydn Society. Invited to return home to form the New Zealand String Quartet, Wilma was first violinist of the group for five years before the NZSO appointed her Concertmaster. She has appeared as Guest Concertmaster with a number of orchestras and teaches violin at Melbourne and Monash Universities. She plays a 1761 Guadagnini violin. Born in England, Caroline Henbest studied at the Yehudi Menuhin School and the Guildhall School of Music before joining the Mistry String Quartet, and then moving to Australia to take up the position of Principal Viola with the Australian Chamber Orchestra. She has performed as Guest Principal Viola with the Sydney Symphony, Melbourne Symphony, Hong Kong Philharmonic, City of London Sinfonia, Scottish Chamber Orchestra and Glyndebourne on Tour. She has worked extensively as a teacher – at Monash and Melbourne universities, the Australian National Academy of Music and the Sydney Conservatorium. Born in Wellington, Alexandra Partridge holds a Masters of Musical Arts from the New Zealand School of Music and is currently studying at the Australian National Academy of Music in Melbourne. Alexandra’s piano trio, the Queensbridge Trio, was named a finalist at both the 2014 ANAM Chamber Music Competition and the Great Romantics competition held at the Melbourne Recital Centre. Alexandra has been selected as an Australian Chamber Orchestra Emerging Artist and toured with the Mahler Chamber Orchestra in Germany after successfully auditioning for their 2016 Academy Residency programme. She has been principal cellist of the NZSO National Youth Orchestra and is a casual player with the Melbourne Chamber Orchestra, New Zealand Symphony Orchestra, Orchestra Wellington and Southern Sinfonia. Alexandra has participated in masterclasses with the Borodin String Quartet and the London Haydn Quartet. Christopher’s Classics invites you to enjoy Dangerous Liaisons, marking the New Zealand String Quartet’s 30th anniversary with music exploring themes of love and desire. Whether inspired by Mendelssohn’s first love, Janacek’s doomed passion, or Jack Body’s inspiration for Saetas in the fire and passion of flamenco, these great works take the audience on an emotional journey - and in the case of Saetas, reveal Rolf Gjelsten’s secret talent as an accomplished accordionist! Celebrating its 30th season in 2017, the New Zealand String Quartet has established an international reputation for its insightful interpretations and dynamic performing style. Career highlights have included performances at London’s Wigmore hall, the prestigious Frick Collection in New York and in Washington’s Library of Congress. 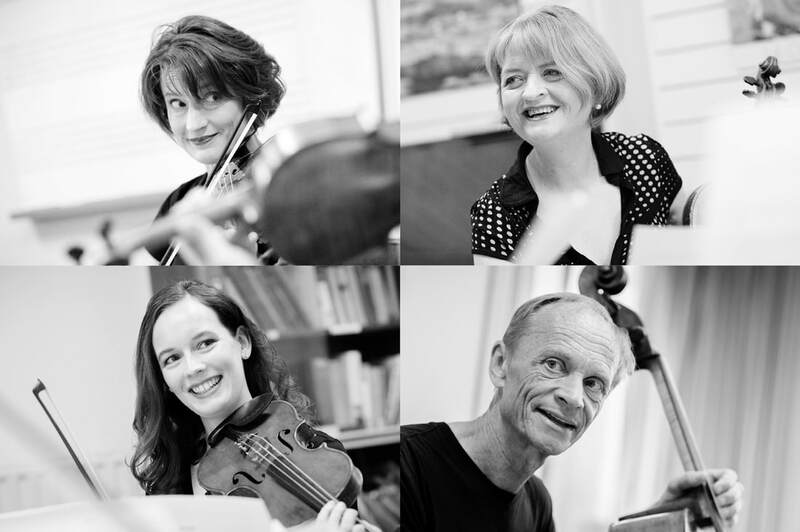 The group has been Quartet-in-Residence at the New Zealand School of Music at Victoria University since 1991 and runs the annual Adam Summer School for chamber music. Gillian, Helene and Rolf have each been awarded the MNZM honour for services to music in New Zealand.